This is not so much a story as a chapter in a dog’s twelve year life. Her name is Honey. She is a golden lab farm mutt. I received the quivering fur ball for Christmas in 2001 shortly before my father left for war. To say the least, I am emotionally attached. With that set up, I know she won’t live forever. Honey is related to Hoover vacuum in the sense that if it is on the ground, it is hers and must be ingested. In November of 2013 she seemed to siphon up something that made her very ill. A trip to the vet and antibiotics were administered for a bacterial infection (possibly unrelated) and an x-ray was taken to see if the something she ate was causing a blockage in her digestive system. 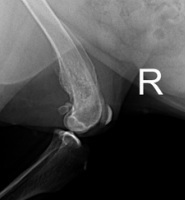 The x-ray showed an empty tract and a very strange growth on her right hind leg. He believed that the growth could be one of three things: Valley Fever, cancer, or both. Valley Fever (Coccidioidomycosis) is a fungal infection that is prevalent in the Southwest region of the United States. An infection starts when spores in the air and soil enter and infect the body. Most common symptoms in humans and animals are a flu-like symptoms, cough, fever, chest pains, and can look like TB in x-rays of the lungs. Valley Fever can also cause join swelling, bone lesions (as seen in Honey), and can spread to lymph nodes. Cancer can be either benign (easily removed mass of cells) or malignant (meaning that it can move through the body and spread). 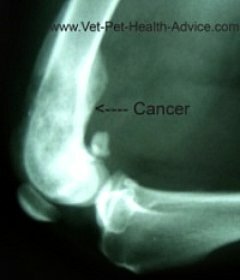 Due to Honey's advanced age and the fact that most cancer takes many mutations and years to become full-fledged oncogenes, the veterinarian surmised that it was more than likely bone cancer (osteosarcoma). We could attempt to remove the leg, but since the cancer had a high chance of being malignant, removing the leg would do no good. The cancer could show up anywhere else in her body. The only thing that did not sentence Honey to cancer was the texture seen on the bone. As you can see in the images below, Valley Fever seems to create a mottling pattern in the bone. Cancer appears as more dense. Honey's blood was taken to be tested for Valley Fever. If the tests came back negative we would know in about two days. If she was positive for Valley Fever it could take up to two weeks for a titer to be completed to see what strain she had and how serious it was. When a phone call came four days later I was assured Honey tested positive for Valley Fever and more tests needed to be done. Honey was then put on a regiment of antibiotics and bed rest until she was her old Hoover-ing self again. The Veterinarian did caution me that she could still have cancer . Since a biopsy was never done on the area, there is still the chance for it to be a life threatening problem. I opted against a biopsy under the pretense that I did not want to disrupt the cells in the area and let them have an opportunity to float around her body and spread the potential cancer faster. Hopefully Honey will live a happy dog life for many more years. Until then, she always gets excited for the car ride and the inevitable trip to McDonald's for a plain hamburger patty when we go to the vet for quarterly x-rays to monitor her leg. Valley Fever in hind limb. 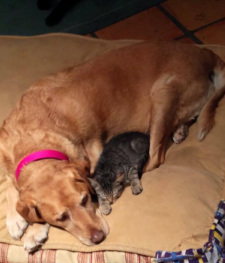 Cancer in dog's hind limb.